Beautiful and durable, the black Metal Framed Jewelry Display Case will complement your most precious jewelry in the most elegant fashion. 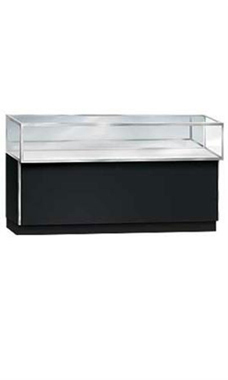 Providing customers a full, close up vision of the merchandise they are viewing, the black jewelry showcase features a tempered glass top, front and sides. It utilizes mirrored sliding rear doors with a lock as well as concealed rear storage, so that jewelers can easily showcase and restock their jewelry. The case is constructed from a durable melamine black laminate finish with aluminum metal framing around the entire case. The display case measures 12"H x 20"D, giving you ample room to showcase your finest jewels. Crating for secure shipping is included in the price of the case. Overall, the jewelry case measures 38"H x 20"D x 70"L. Optional lock for rear storage area and light kit available, but sold separately. Ready to ship.